Next month I get to go on safari to Tanzania, and I'm getting pretty excited about it. New gear (most notably a Nikon D2X camera) has been purchased, learning curves are getting climbed. I'm also spending some time looking at the photos I took the last time I was in the African bush. The photos were taken with a camera with a modest 2.7 megapixels, but the detail I see is still fresh to me. I remember taking every shot, but the fine details of the images reassert themselves with each viewing. In my mind's eye the compositions are simpler, colors bolder, shapes more distinct and concrete. 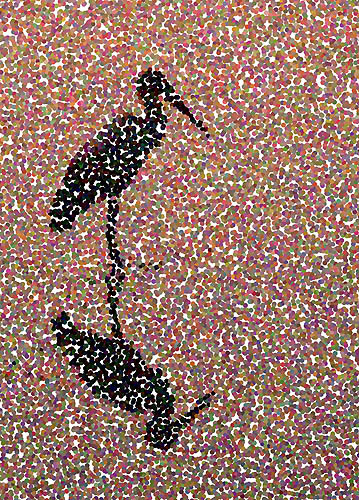 As I've reflected on this, I started to play with some of the images using the artistic tools in Adobe Photoshop Elements 3.0. Below are some of the results, and I feel the images somehow reflect the way I remember the animals. All of the photos were taken within a four day period in Katavi National Park in Tanzania. 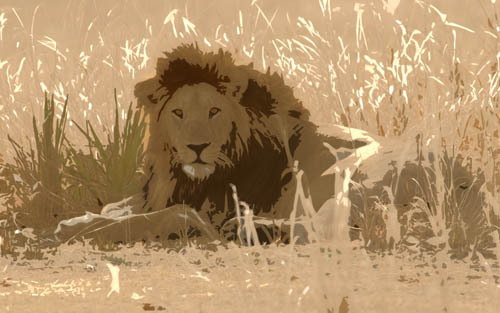 Lions often seem like ghosts in grass, with parts of their bodies fading in and out of existence as they move or as the grass moves around them. Lions are spotted by looking for their dark parts: eyes, ears, and in the case of this majestic male, a dark mane. Giraffes are like aliens. Their proportions seem to be made for a planet with less gravity. Sometimes an animal in the distance is difficult to identify. At 500 meters, a buffalo and a hippo can be difficult to tell apart, especially if there is heat shimmer. But giraffes are never tough to make out unless they are obscured by trees. 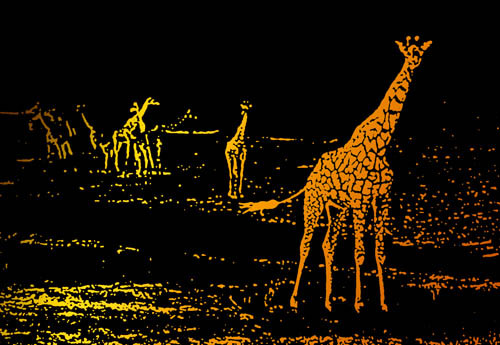 I like this image because even though the scene is heavily mdified, the distant shapes still say "giraffe" to me. 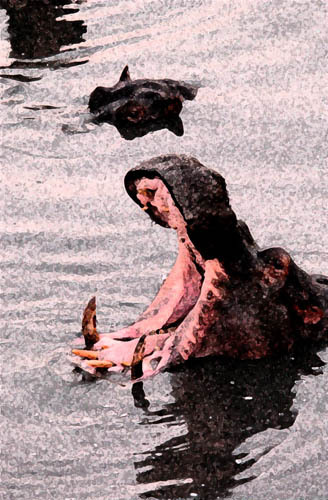 I wish I could show how hippos sound with a picture. It is loud, powerful, explosive grunting. In modifying this picture, I tried to make it bold and coarse, something like the attitude and sound of a male hippo in a crowded pool. This image might look familiar... it is the same one used in the SafariShots.com logo at the top of this page. The shot was taken in near darkness, so I could barely make out the bird. It's edges were far less distinct to my eye than what the camera captured. In this impressionistic version I have tried to obscure the edged while retaining the sahepe. I also like the mix of colors in the water. They reflect the uncertainty of our color perception in the dim red light after sunset. 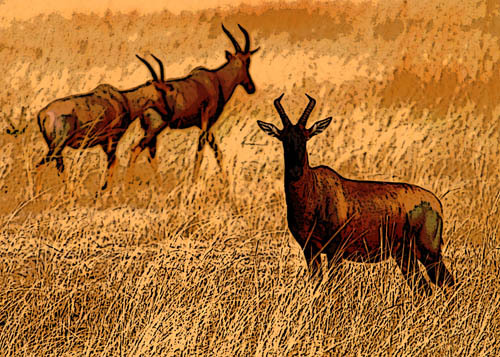 Topi, darker than other antelope, stick in my mind because of their contrast. Their black faces and powerful builds are unique. Here I have tried to emphasize their contrast to their environment, emphasizing edges but trying to retain a sense of depth in the shot. I always think of zebras as having more stripes than they really do. I've also been told that many African people see zebras as black horses with white stripes. I always see them as white horses with black stripes. 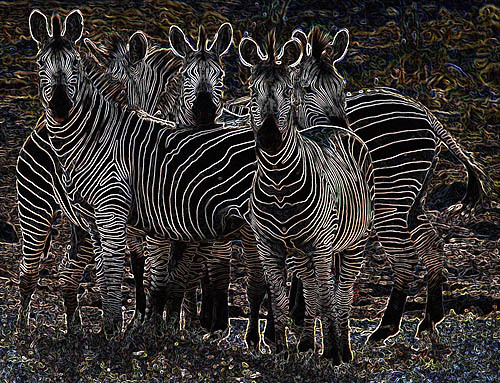 In this rendition, I've tried to make them seem like black horses with lots of white stripes... sort of a combination of the way I imagine them (lots of stripes) and trying to see them as others do.